It can feel overwhelming to shop for professional wear. 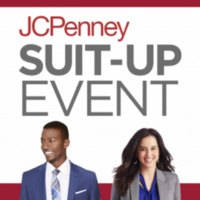 Come get help from UTA volunteers at UTA JCPenney Suit Up AND an extra 40% discount on clothes. The extra 40% will be added to sales prices for an even lower cost to you! Transportation will be provided between the Maverick Activity Center to the Parks Mall in Arlington. This special event will offer discounts on career-wear attire, as well as makeovers by Sephora and more! Plus - shop the rest of the store after it has closed to the public! Gift card door prizes every 30 minutes! Buses will be running continuously from the Maverick Activities Center from 6:30 - 9:30 p.m. on Sunday, September 16th. Be sure to bring your UTA student ID to be able to get on the bus - or drive yourself there and enter JCPenney at the Salon entrance.